2,000 families involved in NorthPop! We are pleased to announce that we have reached an important target in the NorthPop study. There are now 2,000 families involved with NorthPop, meaning we are well on our way to reaching our target of 10,000! This makes about 6,000 individual participants so far in total! The health data collected in the study is a goldmine for research in common diseases among children. Children and young adults make up about 50% of the population in Västerbotten. The study covers exactly this group. Together with Västerbottens Hälsoundersökning (VHU), which covers adults from 40 years and older, this enables among other things new multigenerational research projects. ”NorthPop’s database today contains about a million questionnaire questions, and the project has gathered 60,000 aliquots of blood and 7,000 other biological samples like urine, saliva, breastmilk and stool samples. We have also started a very close collaboration where staff in the whole chain from surgeries and hospitals help build up NorthPop”, says Richard Lundgren, who is the study coordinator for NorthPop. 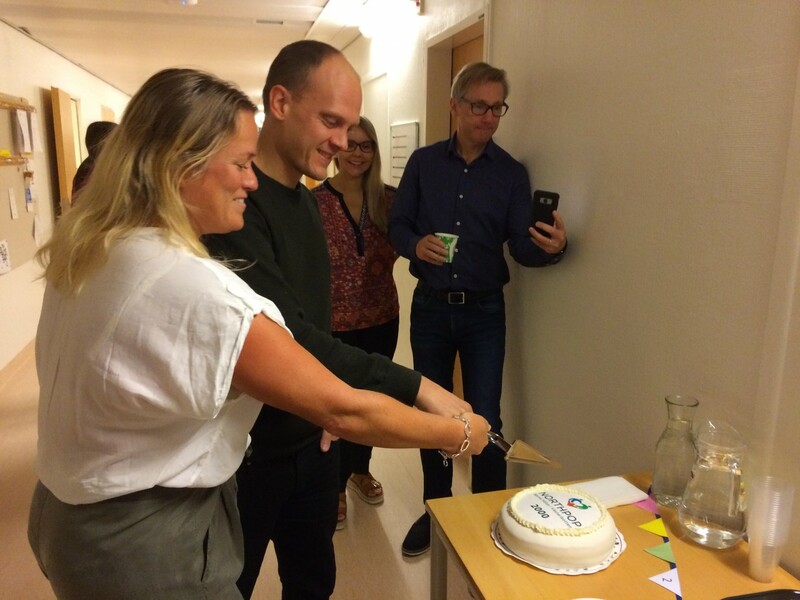 In the picture above, Hanna Nyström and Richard Lundberg cutting a celebratory cake. Hanna was involved in the recruiting of the first participants and Richard Lundgren is our current study coordinator. To the right is Christina West (pediatrician and responsible for research in NorthPop) and Magnus Domellöf (leader and PI of the study).